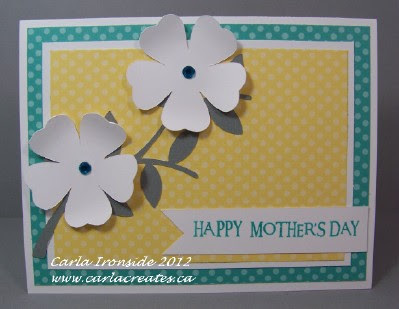 A while back I 'pinned' a gorgeous card from Jeanette Lynton's blog, created by the CTMH art department. Looking at it, I thought it was the perfect card design for Mothers' Day. I changed the card up to use more of my Dotty for You paper and changed the sentiment. I know my Mom and Mother-in-Law are going to love their cards :-) In hindsight, I wish I would have cut the flowers a teeny bit smaller and the stem a teeny bit larger, but - - needed to get these in the mail today - - so I'm embracing the imperfection!